Premise of the study: Microcachrys tetragona (Podocarpaceae), endemic to the mountains of Tasmania, represents the only remaining taxon of one of the world’s most ancient and widely distributed conifer lineages. Remarkably, however, despite its ~150 Myr heritage, our understanding of the fossil history of this lineage is based almost entirely on the pollen record. Fossils of Microcachrys are especially important in light of recent molecular phylogenetic and dating evidence. This evidence dates the Microcachrys lineage to the Mesozoic and does not support the traditional placement of Microcachrys as sister to the southeastern Australian genus Pherosphaera. Methods: We undertook comparative studies of the foliage architecture, cuticle, and paleoecology of newly discovered fossils from the Oligo-Miocene of New Zealand and M. tetragona and discussed the importance of Microcachrys in the context of Podocarpaceae phylogeny. 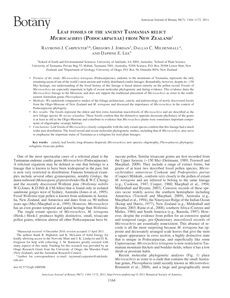 Key results: The fossils represent the oldest and first extra-Australian macrofossils of Microcachrys and are described as the new foliage species M. novae-zelandiae. These fossils confirm that the distinctive opposite decussate phyllotaxy of the genus is at least as old as the Oligo-Miocene and contribute to evidence that Microcachrys plants were sometimes important components of oligotrophic swampy habitats. Conclusions: Leaf fossils of Microcachrys closely comparable with the only extant species confi rm that this lineage had a much wider past distribution. The fossil record and recent molecular phylogenetic studies, including that of Microcachrys, also serve to emphasize the important status of Tasmania as a refugium for seed plant lineages.